Home Pet Rats Can Rats Eat Grapes As A Tasty Fruity Treat? Can rats eat grapes? This is the question for discussion in this article! If you put a grape (or a raisin, for that matter) in front of your pet rat and watch what happens next, you will rapidly discover the answer to, “Do rats eat grapes?” is a solid YES. They sure do! Grapes are delicious. They are sweet and sugary and full of refreshing liquid and rats, like people, tend to love them. But should your pet rat eat grapes? If so, can rats eat green grapes and red grapes? And what about raisins? The short answer to the question, “Can rats eat grapes?” is yes. 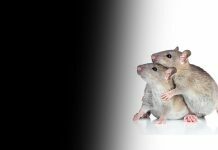 Be aware that there are some veterinarians and rat owners who may disagree based on information about the well-publicized grape toxicity to other pets (namely, dogs). 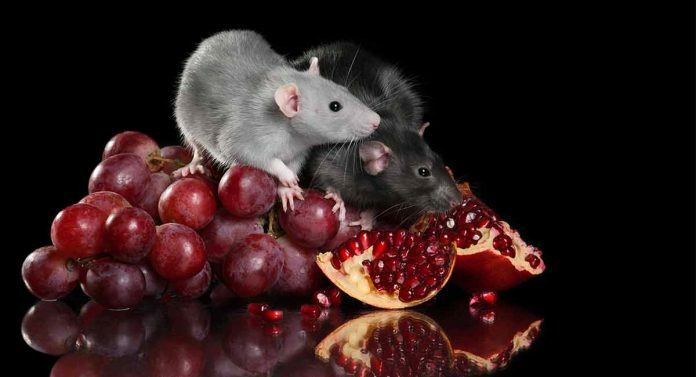 However, most rat owners, rat breeders, and pocket pet veterinarians agree that feeding grapes in moderation – and even diced up raisins in moderation – is perfectly safe for pet rats. Is fruit good for rats? Veterinarians agree that small portions of fresh fruits offered in a weekly rotation can be very beneficial for rats. By offering a selection of fresh fruits as a part of your rat’s daily fresh food diet, you are providing your rat with essential vitamins and minerals, including antioxidants and superfoods for healthy skin, eyes, coat, heart, and immune system. Fresh fruits also have a reasonably high water content, which can really be helpful in keeping your rat hydrated, especially if you are concerned your rat isn’t drinking enough water each day. Offer only organic grapes ifpossible or wash the grapes very well first. Offer the same fruits in a regular rotation, since adult rats may tend to avoid new fresh foods they don’t recognize. Only offer fruits your rat seems to tolerate and digest well – some fresh foods with a high water content- such as grapes- can also cause gas and gastrointestinal upset if fed too frequently or in too large portions. Be sure to remove all of the grape pits, seeds, and stems first for safety. Make sure the fruits are cut up into sufficiently small portions so that your rat can easily chew and swallow without risk of choking. Take care when offering extremely sticky fruits (like raisins) as these may adhere to your rat’s teeth or paws and become a health risk. What nutrients do grapes contain? Grapes are high in several beneficial vitamins and minerals, including Vitamins C, K, and B12. Beneficial minerals in grapes include copper and potassium. Grapes also contain plenty of antioxidants, the most important of which is called resveratrol. Resveratrol is thought to reduce the risk of heart disease in people. As an extra bonus, grapes also contain a healthy helping of fiber, which can support healthy digestive and elimination functions and reduce constipation. Are grapes safe for rats? Can rats eat red grapes, green grapes, purple grapes – any kind of grapes? The short answer is yes. But aside from the grapes themselves, there is another potential toxin which is not safe for your rat to consume, and that is pesticide. Buying organic grapes is the only way to avoid pesticides completely. 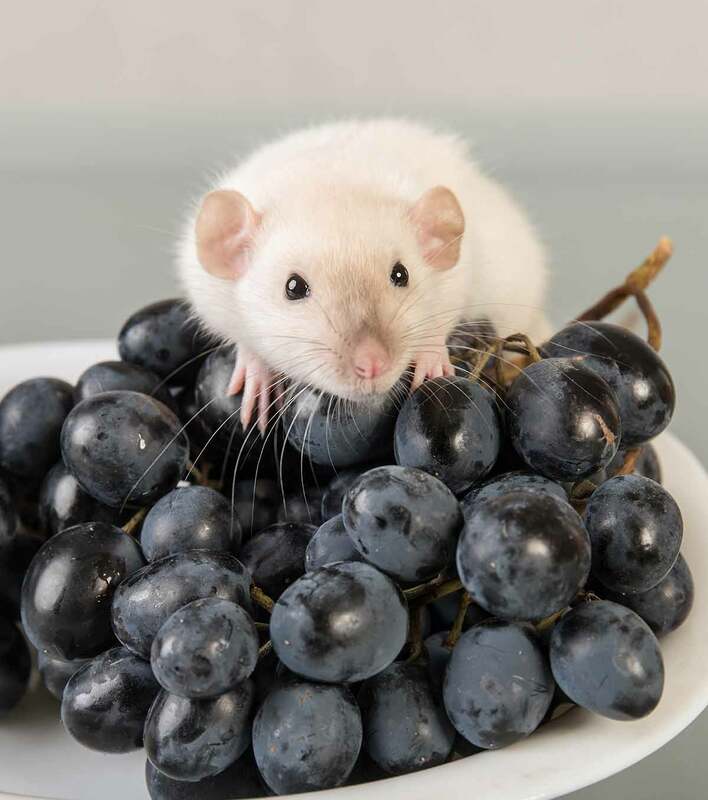 So long as you feed only organic grapes in moderation and your pet rat seems to tolerate them well, the general consensus among veterinarians today is that grapes are safe for rats to consume. Also, some rat breeders and rat owners report that their rats don’t seem to know what to do with a whole grape – they can’t bite into the skin and the grape just rolls around on the floor! If you see this happen when offering grapes to your rat, you can squish the grape between your fingers first to let some of the juices out, slice it in half, or cut it up to give your rat a hint about what to do next! What about raisins (dried grapes)? Raisins deserve their own special mention in any article about feeding pet rats grapes. Raisins are, of course, dried-up grapes. They have a very high concentrated sugar content and are quite sticky and chewy. Most rats really like raisins for the same reason many people like raisins – they are sweet and tasty! 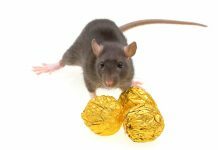 Interestingly, one 2014 research study looked at the link between adult male rats with high cholesterol and feeding raisins (dried grapes). Results showed that feeding raisins helped lower cholesterol, blood glucose, and insulin levels in the rat participants. The main reason to be cautious when feeding your pet rat raisins is because of how sticky they can be. Your rat may get them gummed up on his teeth and have a hard time cleaning his teeth later. If your rat tries to eat a too-large portion of sticky raisins, this can also potentially cause a choking situation. For this reason, it is best to feed raisins in very small, diced portions and to always watch your rat while feeding raisins. Are grapes bad for rats? Grapes are not bad for rats. But they can have certain unwelcome effects (such as obesity and gastrointestinal distress or diarrhea) if you feed them too frequently and in too large quantities. A word about conventional produce and pesticides: if you decide to feed conventionally grown grapes (even if they are grown in the U.S.) be sure to wash them thoroughly and use some type of produce rinse to remove as much of the pesticide as possible. However, be aware that even thorough washing and rinsing with a produce rinse still won’t guarantee your rat will not ingest any of the pesticide that may have leached into the fruit itself while it was growing. The most important tip to remember when preparing a treat portion of grapes for your rat is to be sure you de-seed the grapes and remove any stems or leaves. Always watch your rat when you feed grapes to make sure she is able to eat the treat easily. You can dice the grape up into bite-sized portions to make it easier. At first, try to leave the grape skin on if you can since there are valuable nutrients in grape skins that can benefit your rat. However, if you notice your rat has trouble chewing the skin or simply avoids eating the skin (which can be a choking hazard for young or very small rats), you can skin and slice the grapes for future feedings. Are grapes good for rats? The key to remember when feeding your rat grapes is to feed organic grapes only, to offer them no more than once or twice per week. Dice them into bite-sized portions and peel them if your rat seems to have trouble navigating the grape peel. Can rats eat grapes every day? It is best not to offer grapes to your rat more than once or twice per week as part of a fresh fruits rotation. You can offer half a grape at a time and see how your rat responds. For larger rats, you can offer one whole grape, sliced or diced, at a time. As an overall part of your pet rat’s healthy diet, you can aim for one teaspoonful of fresh fruits and vegetables per day along with your pet rat’s regular prepared diet. Be sure to remove any uneaten fresh foods promptly (after 30 minutes to one hour) to avoid mold growth. My rat ate a grape stem or seed – what should I do? In a wild setting, rats might readily gnaw on grape stems, leaves, seeds, and even the plant roots. One reason rats gnaw a lot is to keep their teeth filed down – otherwise, their incisors (the long front teeth) grow continuously and can cause health issues later. But in captivity, it is best to offer your pet rat other suitable rat-safe materials to chew and gnaw on that you know won’t contain any pesticides or possibly cause abrasion or choking. If your pet rat accidentally ingests a grape stem,seed, leaf, or root and seems to be experiencing distress, the best thing to do is to contact your veterinarian’s office right away for guidance. The happy news here is that yes, you can feed your pet rat well washed, organic, cut grapes in moderation. Do you have a pet rat now? What are your rat’s favorite fresh fruits to eat? Does your rat like grapes or raisins? Please drop us a comment to share your thoughts! Greenleaf, M., DVM, DACVECC, “The Perfect Home for a Rat,” MSPCA-Angell, 2018. Stern, H., DVM, “Caring for Your Pet Rat,” Soquel Veterinary Clinic, 2011. Spanner, S., DVM, “What to Feed Rats and Mice,” Walkerville Vet, 2018. 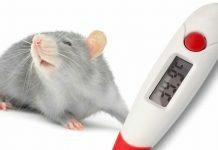 Davies, P., DVM, “Preventative Care in Rats,” Kamloops Veterinary Clinic, 2018. Abdel-Hamid, G.A., et al, “Can raisins ameliorate the hypercholesterolaemia-induced cardiac affection?,” Via Medica Journal, 2014. Ware, M., RN, LD, “What are the health benefits of grapes,” Medical News Today, 2017. Next articleCan Rats Eat Strawberries Or Are They Best Avoided?